I have a degree in English. From the time I was very young, I loved to read. When I opened a new book I felt as if I were walking into a magical world only I was a part of for a short time. During that time, I could be a little girl riding in a covered wagon, a girl stepping through a magical wardrobe into a whole new world, or a governess finding love. Imagine how I felt when I had my first baby. I wanted him to love books just as much as I did! And, he did for a time, but learning to read for himself was not his favorite thing. I had to come up with a way to get him engaged in reading. 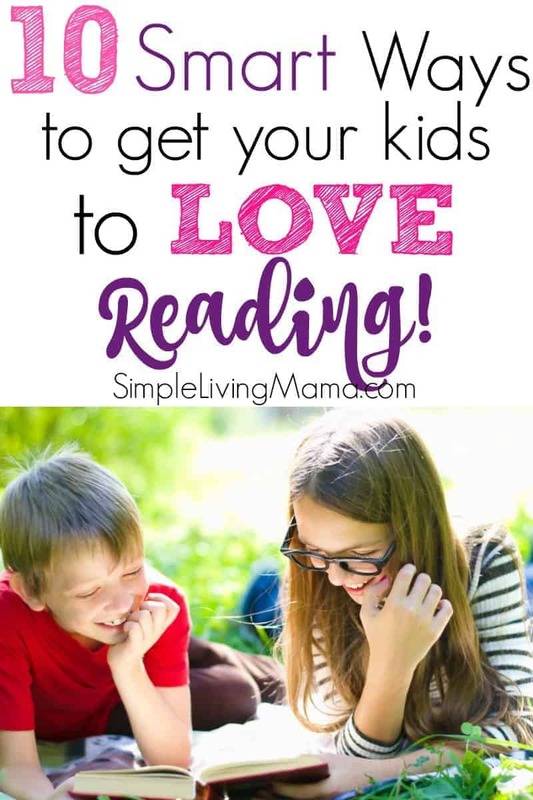 If you have a child who struggles with reading, learn how to get your kids interested in reading! Start reading to your child as soon as he’s born. Your little baby will eventually become a toddler who associates books with love. Pull your child onto your lap and read favorite stories over and over. I have several amazing preschool book lists that are just perfect for young children. Read before bed, read after breakfast, read in the afternoon. Make reading books a pleasurable, bonding experience for your young child. Don’t think your preschooler is too young to enjoy listening to chapter books, and don’t think your tween is too old! Make reading a family affair. We like to read aloud from a favorite chapter book before bed. Here is an amazing list of chapter books to read aloud at bedtime. Build a children’s library and you will always have books on hand for your child to peruse. We keep lots of books on our shelves that our children are free to look through. Even my 18 month old loves to pull a book off the shelf to look at pictures. We created a preschool reading corner in our home for our littles, but you can do this simply with a cozy chair. Keep a few books on a table beside the chair and invite your children to sit and look through their books there. I started taking my kids to the library when they were toddlers. Many local libraries offer story times that are so much fun for younger kids. Older kids can also usually find programs to join. Make it a habit to find books on topics that are interesting to your child and keep those books available. My kids love watching movies. It’s always great to read books together and then watch the movie. Then, we talk about how the books and the movies are different or alike! I love to create preschool lesson plans based on favorite books. My favorite one so far is my Brown Bear, Brown Bear What Do You See lesson plans. We read a favorite book over and over and then do fun activities together with that same theme. You can do this with older kids, too! Make recipes in the books you child reads, like recipes from the Little House series, or do projects together based on books. My oldest had such a hard time learning to read. He thought it was just too hard. I decided to get him more interested in reading by having him read one page, and then I would read the next. This method helped him feel as if the reading wasn’t so long and hard, and it worked! Before long he was reading all of the pages on his own. Another thing my oldest was not a fan of was reading books I chose for him. He loves Minecraft. I ended up finding an entire series of chapter books based on Minecraft characters. He loves these books, and they make it an enjoyable experience for him. If you want your child to do something, you need to do it, too. Kids are sponges and they pick up on our habits, good or bad. If you want your child to enjoy reading, you need to read as well. Read in front of your children. Let them see you with a book in your hand! 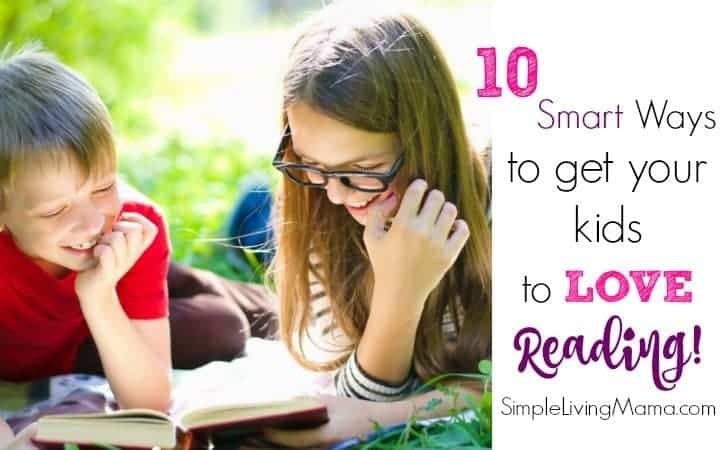 What are some of your suggestions for getting your kids to love reading? This is excellent! I read to my sons all the time, chapter books mainly. They love hearing the stories and I read sometimes for a full hour to them. It is a daily thing in our home. I noticed yesterday at our homeschool co-op, students were asked to read something and take turns (if they wanted to) and both of my sons raised their hands hoping to read. They did so with expression and in a smooth flowing pace. Later on they were asked to read some more, even, because they did so well. At that moment I realized, “This is because of the constant reading we do in our home.” I also make them read two chapters a day in books they tend to choose to read (they pick out books at the library). It really is fun!